I spent a part of my childhood in Kleinburg, attending a school adjacent to the McMichael Canadian Art Collection. I’ll never forget the strange pictures full of colour and wavy forms on the walls of that gallery and in the halls leading into it. I had no idea at that time how important they, and painting in general, would become for me. In the early nineties, I accompanied my Mother to the opening of an exhibition of David Milne’s paintings. It was at that opening that I met A.J. Casson. He came in a wheelchair and was near deaf, but, had a sprightly personality that was not dimmed by his 94 years. I was only vaguely aware of who he was at that time. Untutored in art and only beginning that journey into my passion for painting, I was simply in awe of such a celebrity in our midst. People who knew who he was crowded around to say hello to the legendary painter. I was one of them. I said hello and made a comment I cannot remember and he responded with some cheerful joke. It was then I realized he probably couldn’t hear me over the hum of the crowd. His eyes were piercing and he had a big smile. It was a landmark moment for me. A.J. 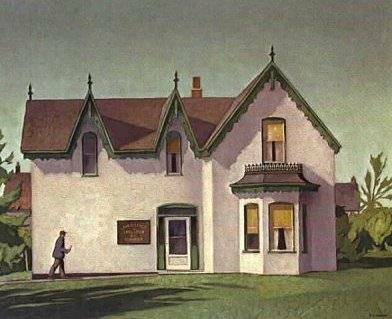 Casson has always been one of my favourite of the Group of Seven. His paintings of places I knew added to my curiosity. 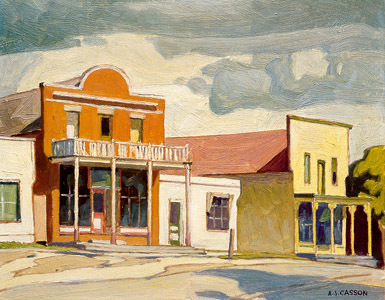 I worked in the building at the left and center of the painting “Kleinburg” as a teenager. The house in “The Client”, I passed twice a day on the school bus. It was, and I believe still is, a Chiropractic Office. My fascination with old buildings was well underway and to see buildings I knew and loved through his eyes and the eyes of his times changed my view of art. 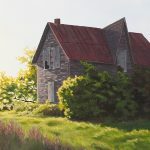 My own voice has come through the merging of my love for old houses and the passion I have for Casson’s and the paintings of the Group of Seven. In the years since, I have learned about him, his generation and the impact his work and the work of his contemporaries had on the world of art. 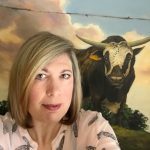 I have stood in awe of beautiful paintings by Casson, Thomson, Harris, Varley, Jackson, Carmichael and others in the Art Gallery of Ontario and the National Gallery in Ottawa. Canada’s Group of Seven took aspects of European impressionists, expressionists and the Fauves and made it their own, creating canvases that brought the remote Canadian wilderness to the eyes of urbanites and were instrumental in helping create a national identity for a country that has long struggled to maintain one. Casson, passed away only months after that meeting, in early 1992. I consider it a privilege to have had the opportunity, even briefly to meet such a great painter. 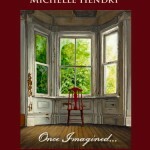 At the time, I had no idea that I, too, would be a painter and how his work would influence mine. I so much see the influence. Interesting how a life can, in hindsight fit together like pieces of an intricate puzzle. Fascinating that you worked in one of those houses! It is funny, isn’t it? The place I worked in was originally the town post office and was a jeweler when I was there and as far as I know, it still is. You can actually find it on Google Street view – Look for Jeremy Jeweler. What a sweet painting–thanks for sharing–I’d never seen it. I once met someone who claimed to be one of the Group of Seven, but I doubted the veracity of that for several reasons.